Max is really into Santa this year. 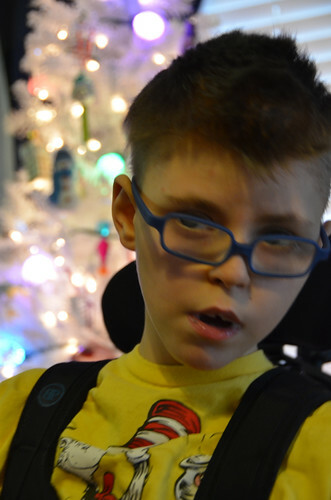 He's gotten to visit with him twice, but aside from telling Santa that he's been naughty and wants a musical instrument at the hospital visit, he hasn't wanted to write Santa a letter. Until this week. Ms. Jacky helped him come up with this letter to Santa. Max came up with all of this with the words in his talker. It's such a great glimpse into how Max talks to us with his talker. This also took about an hour for him to put together. So thank you to Ms. Jacky for being so patient! I’ve been good. Niceness, busy, easygoing, and sweet. I want a musical instrument. Is that just the sweetest? Such a sweet boy! I love his letter. Especially "what's up, Santa!" I was so glad to open my blog and see your blog at the top of my blogroll! I've missed you and Max! Again, how wonderful to see Max's communication skills -- and I can't think of a more perfect person to communicate than Santa! Many blessings and Merry Christmas to your lovely family -- and may Max get everything he asks for! Jenny, he had to get into "greetings", then through four or five choices to get to "What's up!". Such a silly guy! Elizabeth, it's been one wild and crazy week around here. Finals for the girl, rescheduling galore for teachers, therapists and nurses to finish up the year. Now...a couple of weeks of quiet! Max that is such a great letter to Santa, you are a very smart guy.